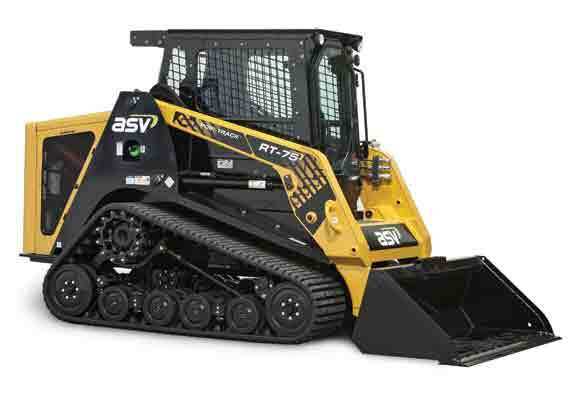 ASV LLC’s RT-75 Posi-Track compact track loader offers versatility with its high ground clearance, low ground pressure and superior traction for a variety of conditions, from fragile turf, mud and wet ground to slopes, ice and snow. The RT-75 is a new compact track loader ASV builds from the ground up, starting with the undercarriage. The machine features ASV’s patented Posi-Track rubber track suspension. Well known for its smooth ride, the dual-level suspension of the RT-75 features both suspended wheels and axles, allowing it to manage every type of terrain and at faster speeds. The suspended wheels and fully-flexible track conform to the ground assuring maximum traction in the roughest conditions. In addition, the multiple wheel contact points and triple-guide lugs — compared to many machines with only one or two guide lugs — achieve maximum performance on steep slopes. The RT-75 comes standard with 18-inch-wide tracks, resulting in a ground pressure of only 3.6 psi. Optional 20-inch tracks lower ground pressures to 3.2 psi. The features, combined with the RT-75’s nearly 15 inches of ground clearance, allow the unit to work in more places, on more days and more comfortably than competitive machines. 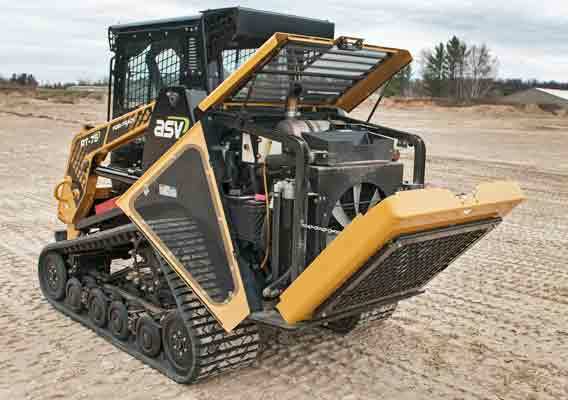 The ASV undercarriage has undergone a complete transformation from a closed design — similar to those used on competitive steel-embedded undercarriages — to an open-rail and drive-sprocket design. The change increases sprocket and bogie life and makes the undercarriage easier and faster to clean. ASV manufactures all rollers with mechanical face seals that don’t require maintenance for the life of the machine. The tracks contain embedded co-polymer cords for extra strength and are produced using a single-cure process, eliminating cure-point weaknesses in the track that can lead to premature breakage. The result is a 1,500- to 2,000-hour track life — 30 percent more than steel-embedded track units. ASV backs that up with an industry-leading two-year, 1,500-hour track warranty. The RT-75 features a Cummins 2.8-liter turbocharged diesel engine. The 75-horsepower engine produces 221 foot-pounds of torque — 13 percent more than the machine’s 80-horsepower predecessor, the PT-80. The torque is transferred to the ground through direct-drive hydraulic motors. There is no need for servicing because the RT-75 does not use planetary drives, and the highly efficient motors transfer maximum power to the patented internal-drive sprockets. With internal rollers preventing friction loss in the undercarriage, all power is transferred to the track regardless of drive speed. The RT-75 achieves Tier 4 Final compliance using a diesel oxidation catalyst that requires no regeneration, no sensors, no diesel exhaust fluid, less wiring and no additional maintenance. ASV designed the machine with serviceability in mind, giving operators easy access to the reliable Cummins engine through a three-panel hood and tilting cooler arrangement. The design, paired with sight gauges for both hydraulic oil and coolant, simplify routine inspections of filters, oil and normal service items. The rearward tilting cab provides easy accessibility when further service is required. ASV built the RT-75’s auxiliary hydraulic system to be highly efficient, including 35.7 gpm high flow and 3,300 psi. Because the machine includes larger line sizes, hydraulic coolers and direct-drive pumps — rather than belt-driven pumps, preventing power loss — more flow and pressure is transferred directly to the attachment. This allows operators to run attachments, such as brush cutters and mulching heads, more efficiently than higher-horsepower machines from other manufacturers. As a result of belt-driven pumps and restrictions in their hydraulic systems, many competitive machines lose as much as 30 percent of the horsepower that is shown on their spec sheets. Conversely, the RT-75 achieves 22 percent more actual hydraulic horsepower than the 80-horsepower machine it replaces. The RT-75 excels in overall performance. The machine features a rated operating capacity of 2,650 pounds and a tipping load of 7,571 pounds. It is 70 inches wide and has a 126-inch lift height. Standard joystick controls make operation easy and intuitive. It comes with an optional all-weather cab that includes heat and air-conditioning and is pressurized for a clean operator environment. The RT-75 also is available in a heavy-duty customization package that includes guarding around areas such as lights, the AC condenser and the rear screen. The RT-75 Heavy-Duty uses a hydraulically driven, auto-reversing cooling fan, similar to the fan used on the RT-120 Forestry, to blow debris out of the engine compartment screens. A full rear brush guard is also available as a factory installed option. The unit can be paired with all standard attachments, such as backhoes, buckets, snow blades, brush cutters and pallet forks.